In your search for a Business Intelligence (BI) or data visualization tool, you have probably come across the two front-runners in the category: Power BI and Tableau. They are very similar products, and you have to look quite closely to figure out which product might work the best for you. I work for Encore Business Solutions; a systems partner that specializes in both Power BI and Tableau. We’ve seen more than a few scenarios in which Tableau was being used when the company really should have gone with Power BI, and vice-versa. That was part of the inspiration for this side-by-side comparison. Unfortunately, the internet is full of auto-generated and biased pages regarding which product trumps the other. The truth is, the best product depends more on you, your organization, your budget, and your intended use case than the tools themselves. It is easy to nit-pick at features like the coding language that supports advanced analysis, or the type of maps supported — but these have a minimal impact for most businesses. I’m going to do my best to stay away from these types of comparisons. In writing this comparison, I did a lot of research. The result was more than just this article: I also created a tool that can generate a recommendation for you based on your response to a short questionnaire. It will generate a score for both Power BI and Tableau, plus provide a few other things to think about. You can try it out here. Some of the sources for this article include the generally insufficient pages mentioned above, Gartner Reports (you should read this), BI forums, and speaking with our own consultants. Let’s get into it. Power BI or Tableau: Which one should you choose? Use our tool and we'll generate an instant recommendation. Founded in 2003, Tableau has been the gold-standard in data visualization for a long time. They went public in 2013, and they still probably have the edge on functionality over Power BI, thanks to their 10-year head start. There are a few factors that will heavily tip the scales in favour of Tableau, which I’ll cover in the next few paragraphs. Let’s make one thing clear from the start: if you want the cream of the crop, all other factors aside, Tableau is the choice for you. Their organization has been dedicated to data visualization for over a decade and the results show in several areas: particularly product usability, Tableau’s community, product support, and flexible deployment options. The range of visualizations, user interface layout, visualization sharing, and intuitive data exploration capabilities also have an edge on Power BI. Tableau offers much more flexibility when it comes to designing your dashboards. From my own experience, Tableau’s functionality from an end-user perspective is much farther ahead of Power BI than the Gartner Magic Quadrant (below) would have you believe. Tableau built their product on the philosophy of “seeing and exploring” data. This means that Tableau is engineered to create interactive visuals. Tableau’s product capabilities have been implemented in such a way that the user should be able to ask a question of their data, and receive an answer almost immediately by manipulating the tools available to them. I have heard of cases in which Tableau actually declined to pursue the business of a customer in the scenario that the customer didn’t have the right vision for how their software would be used. If you just want something to generate reports, Tableau is overkill. Tableau is also much more flexible in its deployment than Power BI. You can install the Tableau server in any Window box without installing the SQL server. Power BI is less flexible which I will discuss in Power BI Weaknesses. Tableau can be purchased on a subscription license and then installed either in the cloud or an on-premise server. Finally, Tableau is all-in on data visualization, and they have their fingers firmly on the pulse of the data visualization community’s most pressing desires. You can expect significant future improvements in terms of performance when loading large datasets, new visualization options, and added ETL functions. Unfortunately, Tableau comes at a cost. When it comes to the investment required to purchase and implement Tableau – 9 times out of 10 it will be more expensive than Power BI, by a fair margin. Often, Tableau projects are accompanied by data-warehouse-building endeavours, which compound the amount of money it takes to get going. The results from building a data warehouse and then hooking up Tableau are phenomenal, but you’ll need an implementation budget of at the very least $50k – plus the incremental cost of Tableau licenses. Of course, a data warehouse is not a requirement. Tableau connects to more systems out-of-the-box than Power BI. However, Tableau users report connecting to fewer data sources than most other competing tools. Overall, considering the investment required to implement a data warehouse is a worthy indicator of the commitment required to get the most out of Tableau. Power BI is Microsoft’s data visualization option. It was debuted in 2013, and has since quickly gained ground on Tableau. 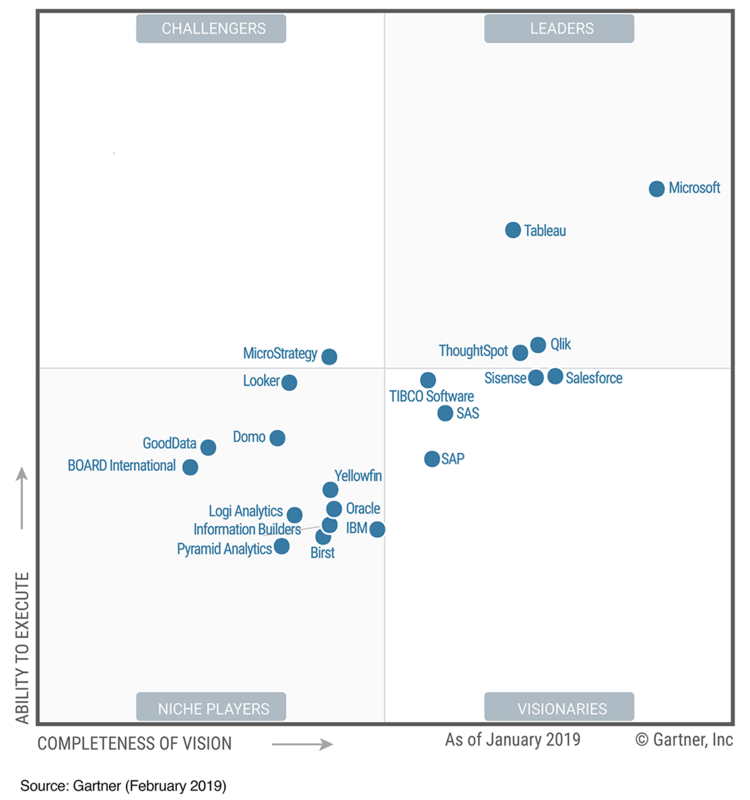 When you look at Gartner’s most recent BI Magic Quadrant, you’ll notice that Microsoft is basically equal to Tableau in terms of functionality, but strongly outpaces Tableau when it comes to “completeness of vision”. Indeed, the biggest advantage of Power BI is that it is embedded within the greater Microsoft stack, which contributes to Microsoft’s strong position in the Quadrant. Though Tableau is still regarded by many in the industry as the gold standard, Power BI is nothing to scoff at. Power BI is basically comparable to all of Tableau’s bells and whistles; unless you care deeply about the manifestation and execution of small features, you’re likely to find that Power BI is fully adequate for your BI needs. As I mentioned, one of the biggest selling points of Power BI is that it is deeply entrenched in the Microsoft stack – and quickly becoming more integrated. It’s included in Office 365, and Microsoft really encourages the use of Power BI for visualizing data from their other cloud services. Power BI is also very capable of connecting to your external sources. Because Power BI was originally a mostly Excel-driven product; and because the first to adopt Microsoft products are often more technical users, My personal experience is that Power BI is especially suitable for creating and displaying basic dashboards and reports. My own executive team really likes being able to access KPIs from the Office portal, without having to put much time into the report’s creation, sharing, and interactivity. Power BI’s biggest strength; however, is its rock-bottom cost and fantastic value. For a product that is totally comparable to the category leader, it’s free (included in Office 365) for basic use and $10/user/month for a “Pro” license. This increases adoption of the product as individuals can use Power BI risk-free. For companies that don’t have the budget for a large Business Intelligence project (including a data warehouse, dedicated analysts, and several months of implementation time), Power BI is extremely attractive. Companies that are preparing to “invest” in BI are more likely to add Tableau to their list of strongly considered options. Power BI is available on a SaaS model and on-premise; on-premise is only supported by Power BI Premium licensing. Microsoft is also investing heavily in Power BI, and they’re closing the small gaps in their functionality extremely fast. All of those little issues some users have with Power BI are going to disappear sooner rather than later. As I’ve mentioned, Tableau still has the slight edge on Power BI when it comes to the minutiae of product functionality; mostly due to their 10-year head start. But perhaps Power BI’s greatest weakness is its lack of deployment flexibility. For Power BI on-premise you need to install the Power BI Report Server as well as the SQL Server. I also mentioned that Tableau works well for users with large amounts of data and for users that want on-premise systems. You should be aware that there are some new features being added to Power BI via Power BI Premium that help catch Microsoft up to Tableau in the areas of large datasets and on-premise capabilities – but Power BI Premium adds significant cost, and these features are relatively new. Tableau still reigns in these areas. For the foreseeable future, anyone who has users that will spend more than an hour or two per day using their BI tool might want to go with Tableau. Its range of visualizations are still unparalleled. If you need the bells and whistles – go with Tableau. Nope. This is another one of those comparison write-ups that doesn’t declare a winner. However, I will say this: if this article wasn’t enough to help you decide, you should try out Power BI, just because it is a little simpler and way less expensive. If Power BI doesn’t do everything that you need it to, definitely check out Tableau – you’ll appreciate the upgrade. If you’re still reading, I’m going explain fully how the BI recommendation tool I built works. It will give you some additional information to help you make a decision. I’ll break it down question-by-question, but you should really try it out. For customers above $20 million, I added a few points for Tableau. For organizations less than $5 million, I added a few for Power BI. This is because organizations of a certain size may be ready for the investment that goes along with Tableau, or not. Anything less than $50k, and you get points for Power BI. As you go greater and greater, Tableau adds points. Above $25/user/month: points for Tableau. Less than $25/user/month: points Power BI. If you’re implementing with Developers, or a combo of Developers/Business, you get points for Tableau. Analysts: Points for Tableau. Everyone: No points. Executives: Points for Power BI. More users equals higher likelihood of Tableau, for the same reason as the revenue question. If greater than 5, I added a few points to Tableau. I also used this question to help determine the additional recommendation of a data warehouse. How Will You Be Using the Tool? For dashboards: points for Power BI. For ad-hoc exploration: points for Tableau. The more support you want, the more points for Tableau. The more you want a gold-standard tool, the more points for Tableau. If you do – small bump for Power BI. The more you agree with this statement, the more points for Tableau. Comfortable Spending Extra Time or Money?